Butler has the only Kansas professors teaching NASA courses to community college students. The NASA Community College Aerospace Scholars program offers community college students interactive, web-based courses. These courses are being led by community college professors nationwide. 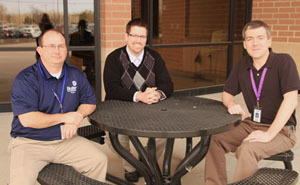 Three of the faculty picked to teach the NASA courses are Butler Community College instructors. Butler’s Danny Mattern, professor of physics, and Adam Anthony, adjunct professor of mathematics, will also be teaching these courses. The students are expected to complete 20 hours of online work. Included in these 5-week courses are webinars that feature NASA scientists and engineers. Students from across the country will work together in several of the activities. Out of the 600 community college students accepted into this highly competitive program, 200 will be chosen to attend a four-day onsite NASA experience. During this program, the students interact with NASA engineers and learn about science and engineering careers. As of now, Butler students are not involved in the program, but these three Butler professors want to change that. They are encouraging Butler students to apply for next year’s program. Students who apply must be enrolled in at least three credit hours per semester. These courses do not have to be all STEM classes, but students need to have completed or be enrolled in nine hours of STEM courses.